Should I do many shallow quick cuts or a single deep slow one with my router? Most cutting tools have a certain removal rate of material at which they should operate. You don't want to go too slow because it takes forever. And if you go to fast the tool heats up too much. This question is concerned with the latter one on a router. I heard that the usual technique is to plunge the bit only a little and not the full depth of the cut. Then make several cuts plunging deeper every time. That makes sense. It reduces how much material is removed in one go. Couldn't I achieve the same thing by doing one single cut with the bit plunged to the final depth, cutting very slowly? What's the better way of doing it? Always make sure your bits are sharp and take small bites with the router. If the router bit travels too slowly, it can burn and/or burnish your workpiece. 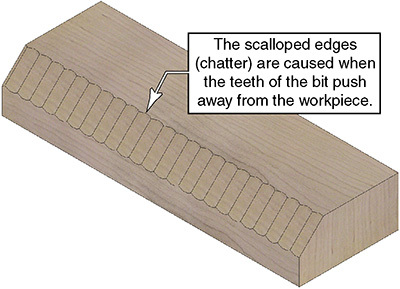 Heat from taking too large a bite or moving slowly can also destroy the temper on the router bit, causing it to dull faster and/or break. Carbide bits are more resistant to heat than high-speed steel bits, but both can dull and break under high heat. Also, larger-shank bits are able to dissipate the heat more readily than smaller-shank bits. For example, all else being equal, a bit with a 1/2" shank will stay cooler than the equivalent bit with a 1/4" shank. Often you should remove the bulk of the waste with a different tool first--for example, a saw or drill--then finish up with shallow passes with the router. Sometimes you might also use one router bit for the first "hogging out" pass, then switch to the bit that has the final profile you want. For example, when routing dovetails, a common recommendation is to remove the bulk of material with a straight bit, then finish up with the dovetail bit. For cuts with a router, slow also can mean burnt material. If I have a complex profile to cut, I either break it into multiple passes with multiple bits, or I sneak up on it, going slightly deeper each pass. Some folks also make a deep pass at close to the final depth, then make another shallow, fast pass at final depth to finish up the cut. I've tried both with a router. Cutting a 3/8th in deep groove though a board is a lot more work and it is a lot easier to mess it up. I burned a lot more wood. You also have to push harder which means it is easier to wobble the router as you move it along. I generally go for 1/8" passes, for 1/2" or bigger bits. It doesn't really take long to make the pass, reset the bit to the next depth and run it again. Each time it is actually a little easier. I do find if you are going to go for broke, leaving enough to do a 'final' pass to clean everything up is a very good idea. One problem with a deep cut is the wood chips needs to be removed from the cut area, or it will be recut and the dust will add friction and heat. If you want to do a deep cut you can use a constant stream of compressed air to clear the wood chips and cool the cutter at the same time, which allows you to not burn the wood and also cut faster. More, shallow hits is generally a better philosophy. The other answers have made good points but something they haven't touched on is "chatter". 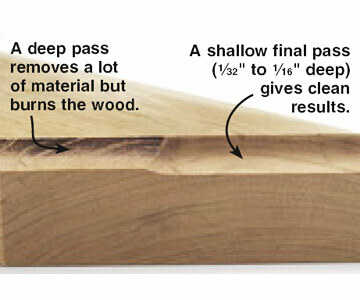 If you use a single, deep pass (even with a slow "feed rate", that is the rate of travel of your router), due partially because of chip clearance problems and partially just because the bit will have a longer part of the edge "hitting" the timber with each revolution, the bit will tend to be pushed out away from the cutting face with each revolution. Each time the bit is pushed away from the timber you're going to end up with a judder mark left on the timber. This'll be lessened by using a spiral-cut router bit rather than a straight-fluted one, and also by taking shallower passes. I always "knew" the answer, but I didn't know why. So I emailed the question to router expert Pat Warner. His web site contains a wealth of information on safe, efficient use of a router. His response was that in addition to creating burns and chatter in the cut, the deeper cut causes the motor to draw more amps, possibly even to the point of burning out the motor, if you don't break the bit first. The long bits are made for trimming the edge of a board, where you can take very light cuts. Pat recommends never making a cut deeper than 3/16" on an inside cut. Not the answer you're looking for? Browse other questions tagged technique router router-bit cutting durability or ask your own question. How can I chamfer thick (1.5") material? Proper bit selection for plunge router? Most efficient bit characteristics for 1-1/4hp router.